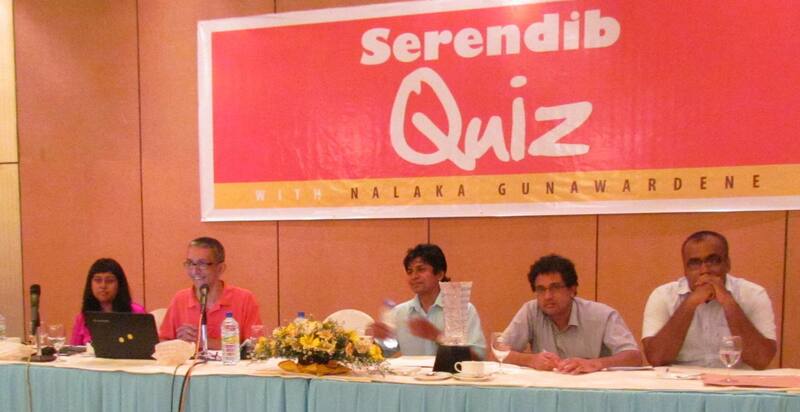 I just finished hosting the first edition of Serendib Quiz, a new live quizzing event in Sri Lanka. A team of private individuals, called the ‘Invictus Team’, emerged overall winners at the inaugural Serendib Quiz held at the Galadari Hotel, Colombo, on 29 July 2012. Invictus beat 40 other teams from all over Sri Lanka to win the top prize of Rs. 100,000 and the specially designed Serendib Quiz glass trophy. Two other individual teams – Chamara Sumanapala’s Team and Imran Furkan’s Team – secured second and third places respectively. A total of 205 players, in 41 teams, took part in this live quizzing event compiled and hosted by Nalaka Gunawardene, a leading quizzing professional. Participants’ ages ranged from 13 to 65 years. Many teams came from schools, banks and private companies while a number of quiz enthusiasts competed as private teams. The team representing Dharmaraja College, Kandy, was the winner in the educational category, followed by Ananda College and the Royal College A Team. All members of these teams received British Council Library gold memberships, in addition to book vouchers and books. Srilankan Airlines came first in the corporate category, while Seylan Bank was the winner in among banks and financial institutions. Serendib Quiz was organised by Quiz World (Pvt) Limited and sponsored by Commercial Credit PLC in partnership with Sarasavi Bookshop (Pvt) Limited, Fast Ads (Pvt) Limited, the British Council, BT Options, TVE Asia Pacific and Kent Holdings. Serendib Quiz involved 50 questions from all areas of knowledge, local and global, presented in five rounds. Contestants worked simultaneously in teams to write out answers that were immediately marked by a three-member judging panel. 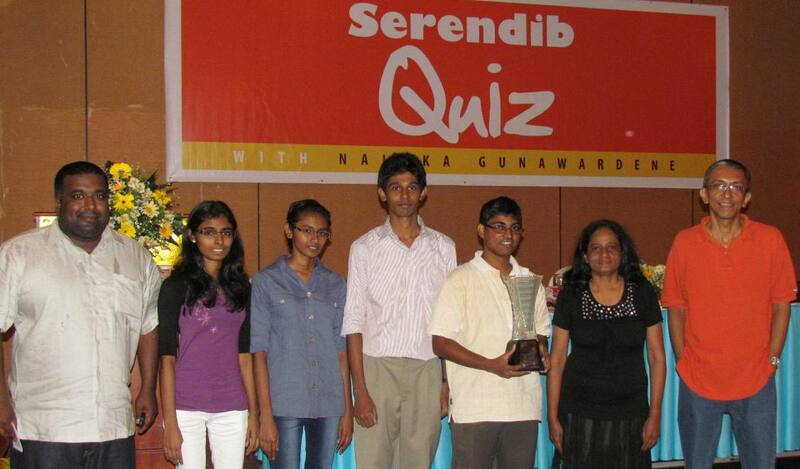 Serendib Quiz with Nalaka Gunawardene: Test Your Brain Power, Win Prizes! Quizzing is a well established hobby as well as a mind sport around the world. Participants engage in a friendly tussle using quick wits and sharp memories. Also known as general knowledge competitions, quizzing has been a popular programme type on Lankan radio and TV for several decades. Recently, reality quiz shows on TV have renewed interest in this activity. Now, a group of quiz enthusiasts have launched named Serendib Quiz, a live quizzing event to nurture a serious quizzing culture in Sri Lanka. The first Serendib Quiz will be held on Sunday, 29 July 2012 at 2.00 pm at Galadari Hotel, Colombo 1. The quiz, in English, will involve 50 questions from all areas of knowledge, both local and global. It will be compiled and conducted by Nalaka Gunawardene, one of the most versatile quizzing professionals in Sri Lanka who has over 30 years of experience as a quiz kid turned quizmaster. Participation in this team event is open to all educational institutions (schools, universities, training institutes), public and private establishments, banks and other financial institutions, as well as groups of private individuals. Serendib Quiz is sponsored by Commercial Credit PLC in partnership with Sarasavi Bookshop (Pvt) Limited and Fast Ads (Pvt) Limited. The media sponsors are Daily News, Sunday Observer and TV Derana.